Walking into Miller’s Seafood & Steakhouse, you just know that it’s something special. Maybe it’s the smell of great food, the beautifully remodeled building, or maybe it’s the warm greeting and the feeling of family. Miller’s has been a tradition on the Outer Banks for generations and an integral part of the community. In September 2016, after Hurricane Hermine, they generously opened their doors and fed all the utility workers who came to restore power on this sandbar. Who would’ve known that just a month later they would be hit again and find themselves under water following Hurricane Matthew. 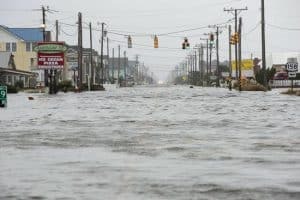 Living and working on the Outer Banks forces a resiliency. The Miller family demonstrates the perfect example of this, bonding together to come back even stronger than before with a new look and updated menu. The new beachy décor is fresh and inviting, but the addition of sushi to their menu is definitely the tastiest change they have made. These aren’t just your average sushi rolls, this is sushi fusion. Mixing ingredients such as lobster tail, soft shell crab, jalapenos, mango, pear, and bacon, with more traditional sushi flavors – Miller’s new Sushi Chef, Orlando, dreams about sushi. Orlando joined the Miller family a couple months ago. After traveling and working around the east coast to improve his skills, Orlando is very meticulous and proud of his creations. Recently, we had the opportunity to try one of their most popular dishes, The Miller Roll. It featured a large, perfectly-cooked, tempura-fried lobster tail along with asparagus, scallions, and avocado rolled inside. Then it was topped with masago, spicy mayo, eel sauce, and crispy onion strings. You’ll understand Orlando does in fact dream about sushi. One bite and you will want to return and indulge in more of his creative sushi creations. In addition to their new sushi menu, Miller’s also still offers a full dinner menu of fresh local seafood as well as beef & chicken dishes and is served from 4 p.m. until 9 p.m. Breakfast runs from 7:00 am till noon 7 days a week. Located at milepost 9.5 on the beach road.